SBB´s network is almost fully electrified. 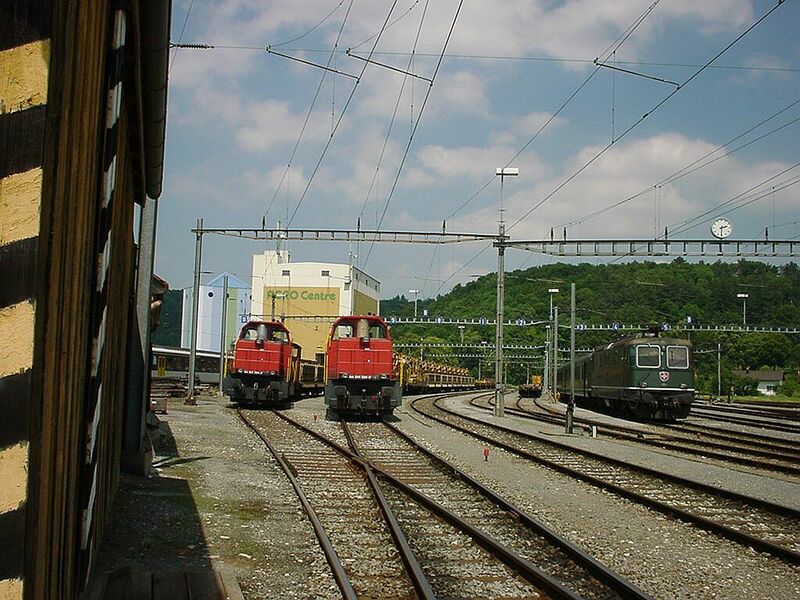 Diesel engines are only used in short distance switching work and at sidetrack connections to industrial railroads. These pictures show mainly rail tractors used for maintenance work and diesel switching engines. Two SBB Am 841 diesel locomotives and one Re 4/4 II series electric locomotive (in its original dark green livery) at Porrentruy station. 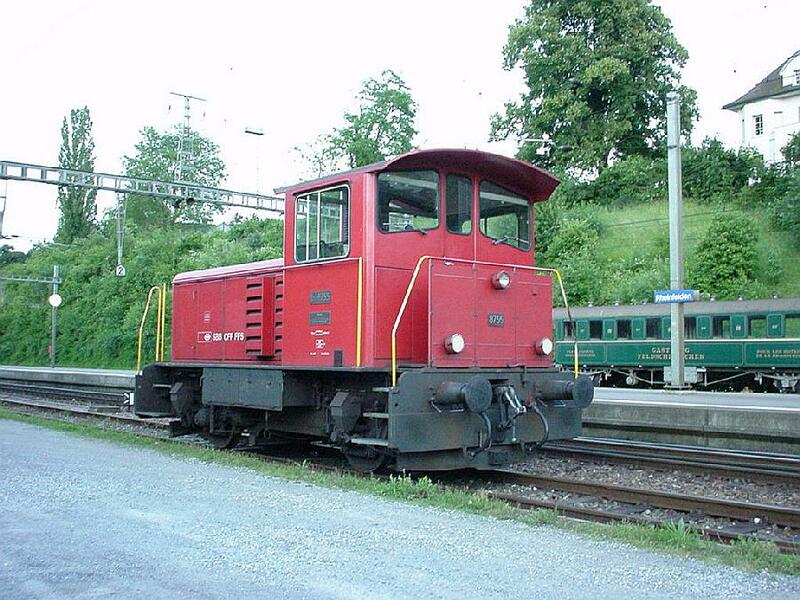 The Am 841 is a fairly new locomotive on Swiss tracks. They were built in 1996 by the Spanish daughter company of the French Alstom group and they are slight modifications of the Spanish state railways RENFE´s series 311, which have been in use in Spain since 1990. It is 14,16 meters long, weighs 73 tons and has a maximum speed of 80 km/h. It is driven by an 8 cylinder V engine, driving a generator which in turn creates electricity to drive the asynchronous electric drive motors at axles. The locomotive is designed for switching work, railroad maintenance work and light cargo train service. SBB has 40 of these engines. 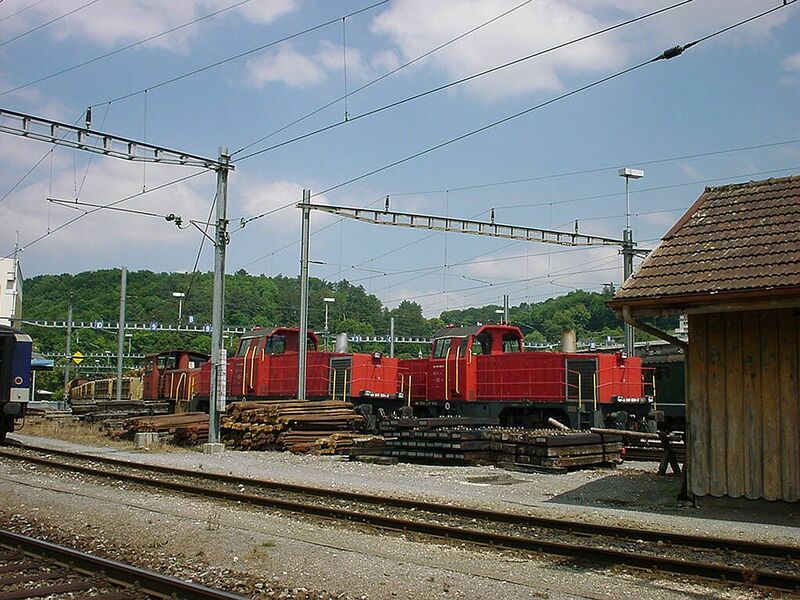 Photo from Porrentruy station 22.6.2002 by Ilkka Siissalo. The Am 841 locomotives were parked at a difficult place for photography, but this picture still shows the side view of the Spanish engines. SBB got these locomotives very cheaply, but still they have been very well liked, especially since the drivers have a very good view to all directions. The Tm 4. series diesel locomotive no. 8755 is built for light switching work by SLM in Winterthur and has a speed of only 45 km/h. It was kept "just in case" at the Swiss station of Rheinfelden. A brand new "rail truck" or diesel engine rail tractor as it is officially classified, the SBB Tm 234 was built in year 2000 and is used for railroad maintenance work. 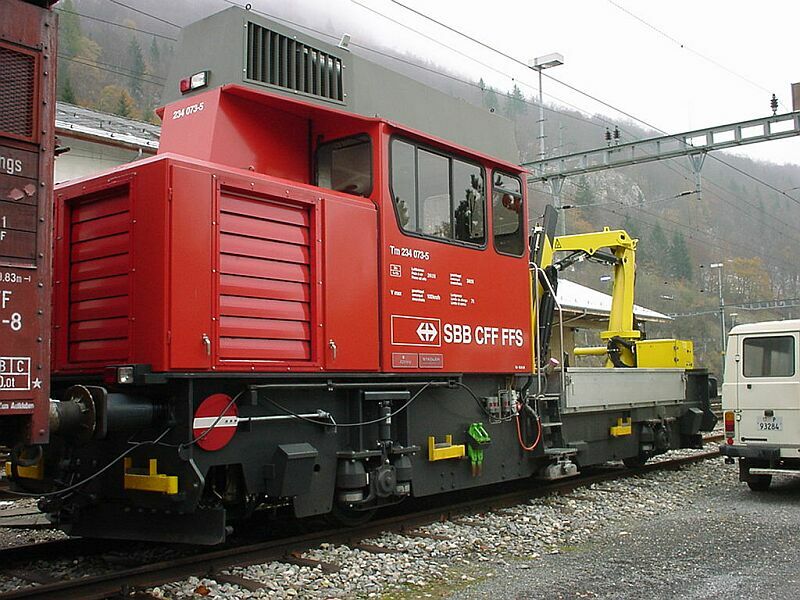 As earlier explained, the Swiss have a habit seen nowhere else in the world that they habitually have one small locomotive, "rail tractor" or other helper engine at each major station. Now many of these Te and Tm series engines have become too old, being from the 1930s-1940s, and are gradually being replaced by newer and better equipment. Photo from Vallorbe station at 2. Nov. 2001 by Ilkka Siissalo.